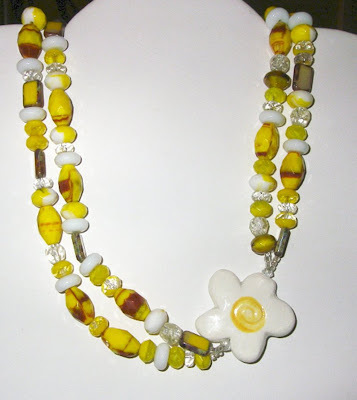 this necklace is designed to have the daisy off-set just a bit - it gives it a fun focus! I am a stay at home mom with 3 kids - so beading and jewelry design is my therapy! I have been creating jewelry designs for several years now - it is really a lot of fun for me when things just sort of come into their own on their own..... like when you have a piece that you have no idea what you are going to do with and it just kind of sits there and all of a sudden something random will be there next to it and WOW - there it is! 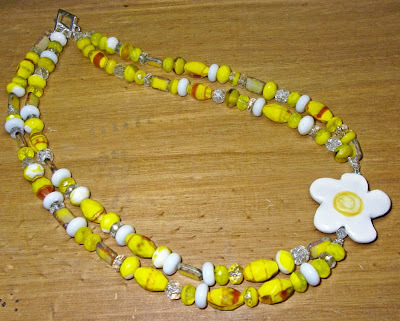 I just LOVE Jangles beads - especially the FLOWERS! I am not afraid of color and I love how I can pair Jennifer's pieces with some fun and funky colors and beads to really show off the pieces.